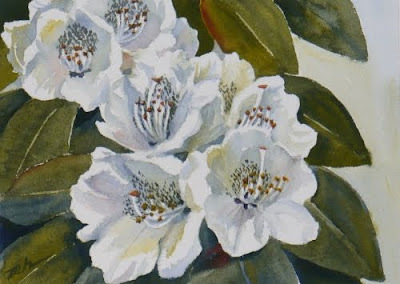 These lovely white rhododendron flowers were painted with my latest process of using only three primary colors. As in my koi paintings, I let the colors mix on the paper to get the various hues you see in this piece. A rainbow of soft colors make up the shadow areas of white flowers which make them a favorite of mine to paint. See my flower art for sale at JanetZeh.Etsy.com. Thanks for stopping by!